Insured Trading Review - Avoid the SCAM! Insured Trading by Oliver Breitner claims to be a highly sophisticated trading software that can make you a ton of profits, but don’t be fooled. Insured Trading is just a scam. 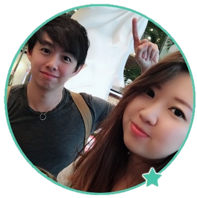 In this review, we explain how Oliver uses lies and fake promises to deceive his victims, how Insured Trading scam makes money off you, and how you can make money for real from the internet. The selling point of Insured Trading software lies in its promise to generate huge profits for you consistently on autopilot. 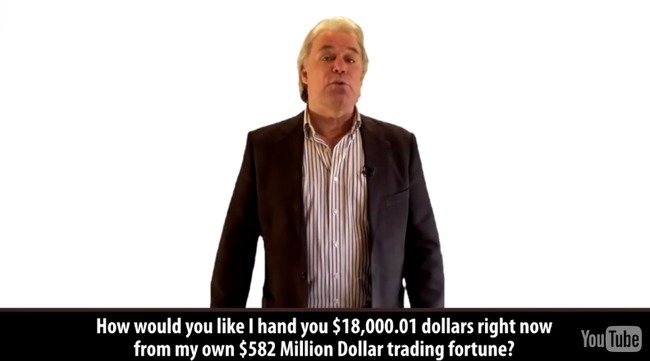 Oliver Breitner, the alleged owner of Insured Trading app claims that he can generate guaranteed profits for you every single day, and this is the stability that many people are looking for. However, did you notice that he calls the app “Insured Outcome App” instead of “Insured Trading App” like what’s advertised in his website? In fact, this is a re-branded Insured Outcome scam that we have reviewed before. If you try to visit insuredoutcome.com, the old website for the scam, you’ll realize that it automatically redirects to insuredtrading.co. They are essentially the same scam. When more and more legitimate review sites exposed the original scam, the scammers had no choice but to give the scam a new name. However, they chose to save cost and re-use the old material (such as the old sales video), hoping that the new victims wouldn’t realize the small inconsistencies in the sales video. This is one of the “member testimonials” that can be found below the sales video of Insured Trading scam. Upon closer inspection, it can be seen that the testimonial was written for “Insured Outcome”, instead of Insured Trading that we are introduced to. This is yet another evidence to show that the scammers are just reusing materials from the original Insured Outcome scam to deceive new victims. The FAQ section of Insured Trading scam was designed to mask the truth behind the scam, so it can be pretty confusing at first glance. For example, in the first FAQ, it was mentioned clearly that there will be no money out of your pocket, because you can get started for absolutely free (see screenshot highlight 1). However, in the following FAQ, it’s said that you need to fund your account with at least $300 to get started (see screenshot highlight 2). So do you need to fork out any money to get started, or not? 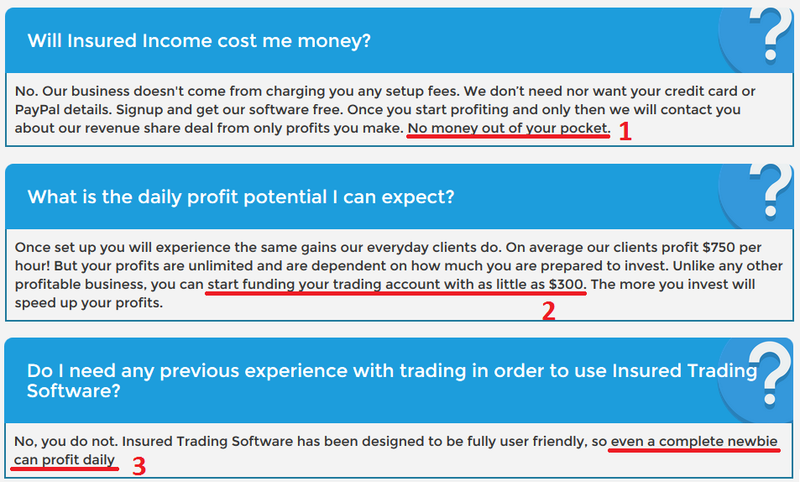 In the 3rd FAQ, it’s said that you don’t need any previous trading experience to make money with Insured Trading software, and even a complete newbie can profit daily (see screenshot highlight 3). Is it really that simple? In the next section, we will debunk all these lies and confusions by giving you a clear understanding of how the scam makes money off you. As much as Oliver and Insured Trading scam wants to keep you in the dark, they have to reveal the true nature of the scam somewhere within their website, or risk being sued. You won’t find this disclaimer document anywhere in the sales material, because it’s supposed to be hidden from you. The only way to access the disclaimer is to find the small fine print at the bottom of their sales page that reads “DISCLAIMER”. You can authenticate our screenshot against their original disclaimer at this link: websiteterms.co/InsuredTrading. Insured Trading allows its users to trade in highly speculative investments which involve a significant risk of loss. Due to the high risk nature of trading, ‘Insured Trading’ explicitly does not make any express or implied warranties or guarantees that user will make any profit or that user will not lose any or all deposited investment funds. Using Insured Trading is far from guaranteed. in fact, it engages in extremely risky, speculative investments. Self explanatory – Contrary to what they promise in the sales materials, Insured Trading scam does not guarantee you any profit. Not only that, you will most likely end up losing ALL of your deposited investment funds. Again, Insured Trading scam admits that trading binary options is extremely risky, and it is only for investors who can stomach the loss of their entire investments. Apparently, what Insured Trading revealed in the disclaimer document is totally different from what they have promised in the sales material. Not only that, we understood from the disclaimer that Insured Trading is in fact, an automated binary trading software. INSURED TRADING IS A SCAM. We strongly advise you to stay away from the scam if you don’t want to lose your hard-earned money. You’ll need to deposit $300 to use the software for trading purpose, and your money will be lost in quick successions. This is how they make money off you. You are better off spending that $300 deposit for a nice dinner with your family than wasting it on a scam like this. I really wish I read this review earlier, and I wouldn’t have lost $500 to these bastards!